This is the recipe for THE best cooked chocolate cocoa fudge—the best of the best. 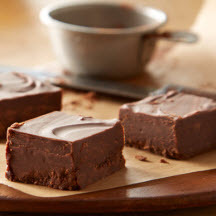 A favorite old-fashioned fudge that has been enjoyed by generations of Americans. Line 8-or 9-inch square pan with foil, extending foil over edges of pan. Butter foil. Remove from heat. Add butter and vanilla. DO NOT STIR. Cool at room temperature to 110°F (lukewarm). Beat with wooden spoon until fudge thickens and just begins to lose some of its gloss. Quickly spread into prepared pan; cool completely. Cut into squares. Store in tightly covered container at room temperature. Makes about 36 pieces or 1 3/4 pounds. High Altitude Directions: Increase milk to 1 2/3 cups. Use soft ball cold water test for doneness or Test and read thermometer in boiling water, subtract difference from 212°F. Then subtract that number from 234°F. This is the soft ball temperature for your altitude and thermometer.